Chief Technical Officer of Indian Institute of Horticulture Research (IIHR), Bangalore, R N Pandey called on Chief Minister Pema Khandu at the latter’s office here today. In a brief interaction the visiting horticulture scientist offered the services of the prestigious IIHR in development of horticulture in Arunachal if the government desires so. Highlighting the activities of IIHR, Pandey informed that with changing times and emergence of new challenges in the fields of productivities, crop production, crop protection and crop utilization, the institute is emphasising on breeding varieties for biotic and a biotic stresses, breeding F1 hybrids, developing integrated pest and disease management technologies, developing integrated water and nutrient management protocols towards optimum utilization of resources, etc. It is also carrying out researches on biotechnological interventions to increase yields, protect crops from insect- pests, disease and viruses, and extension of shelf life of crop produces. Encompassing various goals and objectives of achieving sustainable development of horticulture, providing livelihood security, economic growth and nutritional security which have been challenged time and again by various obvious factors, the IIHR, Bangalore has been carrying out research in fruits, vegetables, ornamentals, medicinal and aromatic plants and mushrooms. Pandey disclosed that with scientific interventions, the institute has been able to breed tomato crops that gives upto 15 kilograms per plant. He said Arunachal Pradesh has immense potential in horticulture and therefore foresees a viable partnership with the state government in the sector. The Chief Minister admitted that there is lot of scope in the sector which the state has so far failed to cash on. 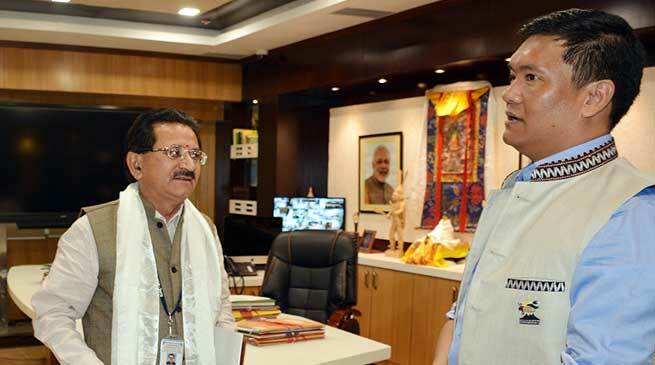 Thanking Pandey for the willingness to help the state in the sector, Khandu assured to depute a team of officers from the state government to visit IIHR and see for themselves the fruits of research done and identify crops that can be produced in the state through use of modern technologies and knowhow. He stressed on production of organic crops and expressed optimism that IIHR cab help Arunachal fulfil its vision of going cent percent organic. Expressing gratitude to the state and its people for the hospitality offered, the IIHR official expressed hope that his interaction with the Chief Minister would open up further interactions and lead to a partnership that would economically boost the horticulture sector of the state.